According to a new report from the Boston Consulting Group. Singapore had 188,000 millionaire households in 2011 – or slightly more than 17% of its resident households. That implies that more than one in every six Singapore households having disposable private wealth of over US$1 million, excluding property, businesses and luxury goods. The biggest question is how many of it are actually made up of foreigners / PR? Based on a report published in business times in 2010. There were 1,712,600 Singaporeans (“citizens”), 334,700 permanent residents (“PRs”) and 1,088,600 foreigners in the labour force as at June 2010. i.e. the no. 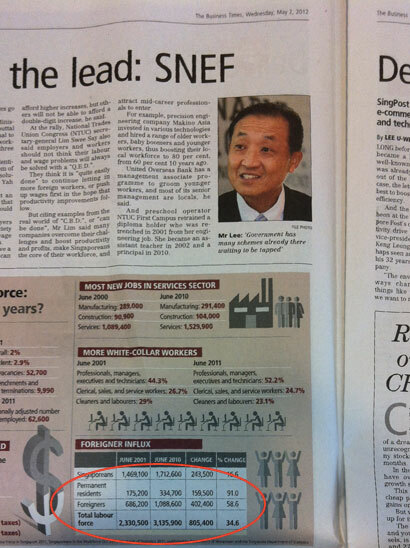 of non Singaporeans workers are 45.39%. Given that approximately half of our workforce are non Singaporeans ,and Singapore is actively enticing super high net worth to come to Singapore (e.g Eduardo Saverin Co-founder of Facebook). it’s likely that only approx 30% of Singaporean households are in this league.